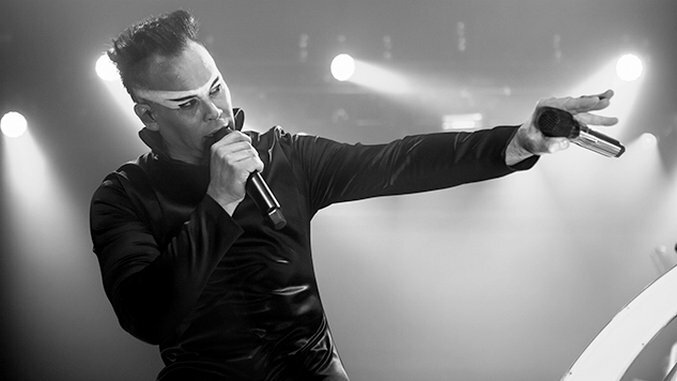 When Empire of the Sun launched its first tour, vocalist Luke Steele joked that he wanted to include elephants and tigers in his space-pop live shows. Except he wasn’t joking, later admitting that expenses and logistics simply wouldn’t allow for a 6,000-12,000 lb pachyderm to venture through a succession of global venues. To compensate, Steele and bandmate Nick Littlemore pack their stage with Flash Gordon-collared, metallic costumes and dancers plucked from a Georges Méliès silent film. Those flourishes meld with a very ‘80s sense of cinema; Steele pays homage to Daryl Hannah’s makeup sensibilities from Blade Runner, and blur your eyes and the stage resembles that scene from The Neverending Story where a pantheon of otherworldly beings debate the end of times right before the horse dies, eternally scarring your childhood. New album Two Vines fits that aesthetic immaculately, with warm analogue synths and reverb-wet snares. Photographer Sarah Midkiff captured the group’s immersive pageantry at Terminal 5 in New York City last week. Empire of the Sun is playing select dates in California through the summer.